As the owner and president of California Family Foods since its establishment in 1995, I am proud to be part of the continuing progress and growth of the company. We talk a lot about the advanced technology of our rice mill—and it's true—it is state-of-the-art and one of the finest in the nation. But above all else, California Family Foods is an organization defined by the character of its people and their commitment to our customers. Every day, in every level of the company, we work to produce an outstanding product from field to the bag. Our families have been growing rice here in Colusa County since 1946. Today we farm over 10,000 acres and are fully invested in every layer of the business. Adjacent to the rice mill, we have a 2 million cwt sack-drying facility and storage capacity that has been in operation since 1982. It is a significant advantage to have the majority of the rice we mill onsite because we can control quality every step of the way. As we work to serve our customers and continue to innovate mill operations, we value and reward the essential qualities of integrity and honesty. We have a dedicated and passionate group of people who take pride in their work. California Family Foods has successfully serviced the domestic retail rice market since 1995 and will grow stronger in the future. From the owners to the employees, we are a group that works together for our customers—we are CALIFORNIA FAMILY FOODS. 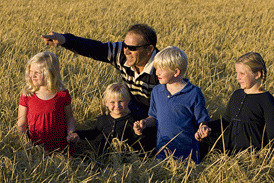 Colusa, CA—California Family Foods President Dave Myers and young friends look out over a rice field ready for harvest. The ClimateSmart program allows California Family Foods to take daily action to try to balance out the environmental impact of the greenhouse gas (GHG) emissions from our facility operations. 100% of ClimateSmart contributions support projects that capture and absorb GHG emissions. Current ClimateSmart projects involve California coastal redwood forestland and dairy manure methane capture: the Big River and Salmon Creek Forest and the Garcia River Forest carbon projects operated by The Conservation Fund on the North Coast of California, the Lompico Headwaters Forest Project operated by the Sempervirens Fund in the Santa Cruz Mountains, and a dairy manure methane capture near Bakersfield operated by California Bioenergy.